They do say there’s no such thing as a free lunch, so although there are lots of free photo editing programs out there, some photo editors are 'freer' than others! Many of the programs on free photo editor lists are not so much ‘free’ as ‘freemium’. There is a free version, but it has a cut-down set of features compared to a paid-for ‘pro’ version and is used to drive sales. If the free version does everything you need that’s not a problem – but you might have to put up with ads or upgrade nagging from time to time. Some free editor software is ‘open source’. It’s genuinely free, with no strings attached, and is developed and maintained by teams of programmers doing this for practice, to gain experience, to build a career or just from ma desire to make great software that’s free to use. The world needs more people like this! We’ve got two open source programs at the top of our list, and they are both very powerful – but they are also highly technical. If you’re a keen photographer you’re unlikely to be impressed by some of the more cheap and cheerful offerings out there particularly amongst the online editors, but there are still free alternatives out there. Don’t overlook the free photo editing and organizing tools that ship with your computer – Apple Photos is better than you might think, for example. And mobile users are especially lucky because they get a choice of great free apps that desktop users will only wish they had too. So we’ve organised our list of top free photo editors into three sections: one for desktop software, one for web-based tools and one for mobile users. Oh, and by the way, if this has really whetted your appetite for free stuff, check our our list of free Lightroom presets. It’s like Lightroom, but free! There are lots of free photo-editors that work like regular image-editors, but Darktable is different and takes on a much more ambitious role, replicating the layout and functions of Adobe Lightroom. It can import your images into a database and offers the same kind of non-destructive editing tools, working on JPEGs and RAW files alike and offering some quite powerful tools including lens and perspective corrections. It’s not as slick or as powerful as Lightroom, but it is completely free with no annoying upgrade nagging or locked ‘premium’ features. GIMP stands for GNU Image Manipulation Program, which probably leaves you none the wiser, but now you know. It’s a highly technical Photoshop alternative which offers more power and features and long-term development effort than you would ever expect from a free application. It’s open-source, which means it’s been developed over a long period of time by many different programmers. It can do a lot of the stuff that Photoshop can do, but you will have to spend some time with the documentation to make proper progress. 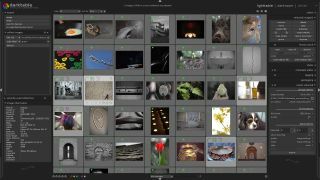 Picktorial 3.5 has just had a major update to include a digital asset management system (DAM) that can manage your photo collection from inside the software. It is a Mac-only program, though, and it’s a ‘freemium’ product, which means that although the basic version is free you need to pay to get the full range of features. In this case, that means an annual subscription of $60, or a little more than half the cost of the Adobe Photography plan. The free version offers photo organisation, RAW/DNG display (but not editing) and only two local adjustments per image. Photoscape X is another freemium photo editor with a basic free version that has an upgrade option to a Pro version where all the features are unlocked, and that currently costs £39.99/£38.99. You can do a lot with the free version, including simple photo editing and enhancement and there’s a wide range of attractive image effects. Many tools are available in the Pro version only, though, so you’ll need to put up with some fairly persistent reminders of things you can do. It’s not really a tool for serious photographers, but Photoscape X is handy for spicing up snaps for social media or family sharing. This is one of a suite of photo-editing tools from Paris-based software company Avanquest. Like many other free photo-editing applications, its a cut-down version with an upgrade path to a premium product. Like Photoscape X, it’s designed principally for simple photo fixes and instant image effects – there are over 100 of these, plus more than 100 picture frames and overlays and 50+ textures. It’s a Windows-only program, though there is an iOS app to go with it. It’s more for fun effects and basic enhancements rather than serious editing, but if that’s all you need, it’s fine. Before you spend a whole lot of time downloading free Mac photo editors, are you sure that the one you have already won’t do the job? Apple Photos is limited in some respects – there’s only a small range of filters and it doesn’t offer local adjustments – but its regular adjustment tools for cropping, exposure, colour and retouching are as good as any free apps and better than many of them. Apple Photos also offers seamless image sharing across all your Apple devices and pretty good image cataloguing and searching tools too. Apple has its own Photos app, so does Microsoft. It’s free with Windows 10 and as well as offering basic photo fixes it lets you add image effects and draw on your photos, if that’s your thing. If all you need is a simple tool for organising your photo collection and adding quick enhancements before sharing them it’s great. If you’re into photography in a more serious way, however, you’re going to have to look elsewhere. The best raw conversions your camera can get? If you own a Sony or a Fujifilm camera you’re in luck. High-end camera software maker Phase One makes free ‘Express’ versions of its high-end Capture One image editing software specifically for these two camera brands. Why use these rather than the software bundled with the camera? Because Capture One’s raw conversions are quite superb. The Express version offers a wide range of important and useful image enhancement tools and image cataloguing/organising features too. You need the regular (and expensive) Pro version for local adjustments and the full range of tools, but these Express versions may be all you need. Why is it that no-one seems to take camera makers’ own software seriously? It’s true that it can often look a bit dated and clunky, and it doesn’t have all the features of a ‘proper’ photo editor like Photoshop, but this is free software after all, and it’s right under your nose. If you have a Nikon camera you should definitely take a look at Capture NX-D, Nikon’s own raw conversion and enhancement software. It duplicates Nikon cameras’ own Picture Controls and white balance settings exactly (unlike most third party apps), it produces very decent raw conversions from Nikon NEF files and it even offers local adjustments via Color Control Points. Free software covers the same range of user levels as paid-for products, s while some of the free apps above are aimed more at the novice market, Digital Photo Professional 4 is aimed squarely at serious Canon users who shoot raw files and want to extract the maximum possible quality from them. It doesn’t have fancy features like local adjustments or image effects, but it does offer perhaps the best combination of sharpness and noise control of any raw processing tool – including Lightroom/Adobe Camera Raw. Like Nikon Capture NX-D, it’s tuned precisely for Canon cameras and lenses and their specific attributes – and it shows in the results. Fotor saves you the trouble of downloading any software at all as it’s entirely web-based – though it did warn us some features might not work when we started it in Safari and we were advised to use Chrome. There’s certainly plenty of adjustments and effects to play around with, though image resolution appears to be limited to 4000px wide with a free account, and Frame effects came with an obtrusive watermark, so there’s only so much you can do without upgrading to a subscription, which is $39.99 per year (about £31.44). Fotor is great for fun projects, but not really a high-end photo editor for enthusiasts. Pixlr X is a new version of Pixlr’s free photo-editor that doesn’t rely on Flash for its web-based editing tools. Flash does add a lot of functionality to web browsers but has a pretty poor reputation for security so it’s good to see publishers phasing it out. The Pixlr X editor is basic but fast. You just upload an image, adjust it and save it back to your computer – though our 12-megapixel test shot was downsized to a width of 4,000 pixels. That fine for a medium-sized print and social sharing, of course. If there’s a premium version we couldn’t find it, and there is a mobile version too that’s also free, though you will get ads unless you pay for an in-app upgrade. Some ‘free’ programs disguise their freemium status until the last minute, but BeFunky is right out there and upfront with its free vs Pro status. There are lots of adjustments you can apply to your images for nothing and some nice-looking effects, but everywhere you go there are even better-looking options that you need to upgrade to get, and that comes with an annual $59.88 subscription (about £47). If you don’t mind constantly navigating through the free vs Pro options, this is a great free online photo editor for fun projects and some reasonably detailed photo editing – though again, our 24MP image got resized to about 4000px wide. Nobody likes being told what to do, but we’re going to do it anyway. Get Snapseed. If you do any kind of mobile photography, editing and sharing, this app has the most power, the most engagement and biggest creative potential of all. You can apply a range of quick-fire effects and filters for your social posts if you’re in a hurry, but you can also drill down into a wide array of filters, each with its own set of control, and each of which can be combined with others using layers – you can even combine images. The most important thing of all is not to tell Google how good this is in case it cans it (like it did the desktop version and the Nik Collection). Adobe gets a bit of stick for insisting that Photographers pay a subscription for using its desktop software, but you can’t complain at the company’s support for mobile devices with free apps that are just the ticket for speedy, on-the-go mobile editing. Photoshop Express offers lots of customisable image effects, Photoshop Mix lets you combine images in layers and Photoshop Fix offers handy mobile retouching tools. You’ll get the most out of this trio with an Adobe ID, but you can also sign in with a Google or Facebook account. Google Photos has had a bit of a muddled history (Picasa, Google Drive Photos) but seems to have settled down into a fast and efficient web-based image storage system with some basic but effective editing tools. You can use it in any web browser and, last time we checked, as long as you’re prepared to accept 16MP JPEGs as an upper limit on file type and resolution, you get unlimited storage. You get a small but effective choice of filters, some similarly basic and effective editing tools and that’s about it – its real strength is its fast and effective cloud-based image organisation and AI-led search tools.